Did you know Rotel began life as a Japanese OEM manufacturer for Sylvania TVs in the 1950s? 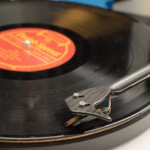 The Japanese electronics company didn’t switch to audio gear until the following decade soon after Tomoki Tachikawa, now 91 years old, founded the company in 1961. Did you know that Rotel was originally called Roland? Unable to register the Roland name worldwide, because of the musical instrument manufacturer of the same name, Rotel was derived by combining Roland and Matel, another early-years trading company of Tachikawa’s (and not the US toy giant). Rotel remains family managed some fifty-five years later. 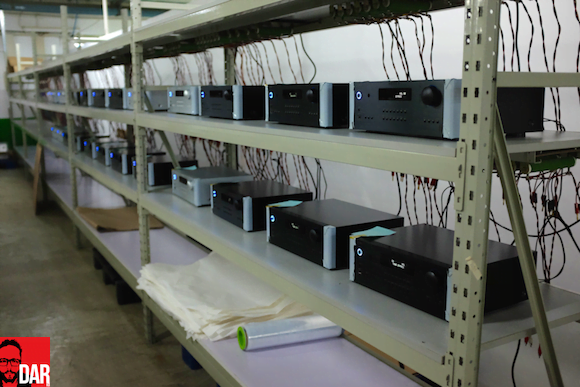 Tachikawa’s nephew, Peter Kao, now helms a company that has remained true to a core value that Rotel make hi-fi and only hi-fi. Diversification not required. 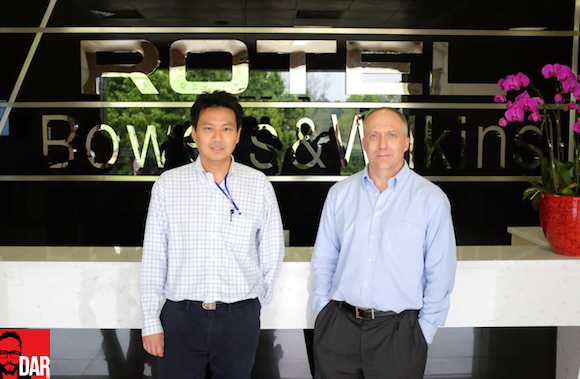 It’s Kao and lead electronics designer Daren Orth who show us around Rotel’s manufacturing plant in Zhuhai’s free trade zone. In pursuit of lower labour costs, Rotel first moved production from Japan to Taiwan in the eighties and then to China a decade later. 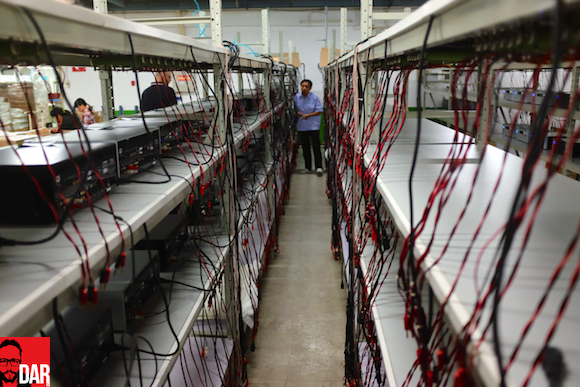 In Shenzhen they rent a multi-floored factory. 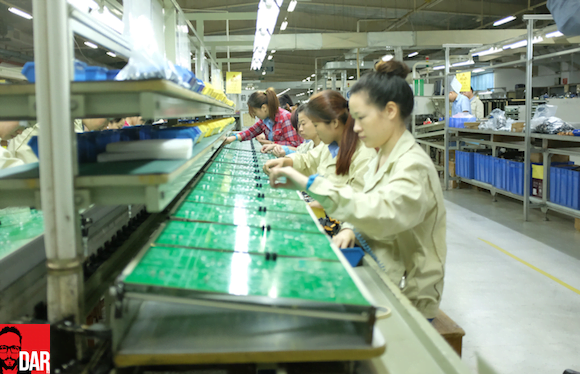 The logistical challenges of managing production across separate levels precipitated Rotel’s move to build their own single-storey factory in Zhuhai. Building on reclaimed land doesn’t come without its own difficulties. Kao shows us how the land around the factory continues to sink. Finally completed in 2005, the move took nine years and US$4.5m. 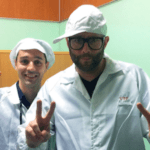 With 9000 m2 and 450 staff at their disposal, the Rotel plant is a somewhat unassuming affair. The vibe inside is unexpectedly relaxed, even out on the factory floor. 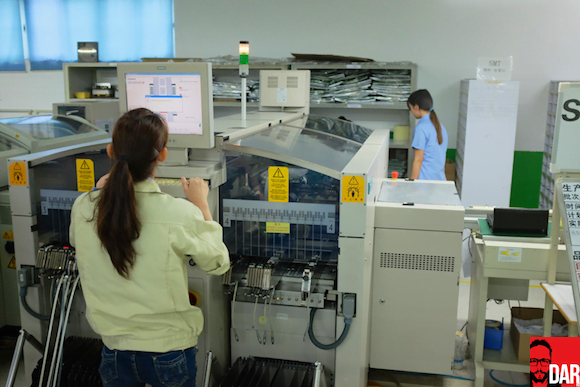 A determination to dispense with reliance on third-party support saw Rotel purchase its own SMT machine in 2010. 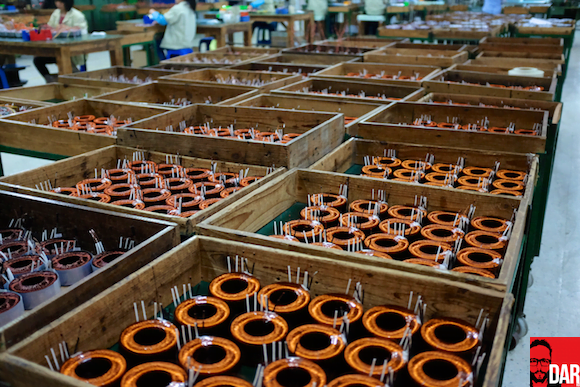 Boards are now built in house before making their way to the production line where through-hole parts are manually placed before being soldered with the ‘kiln’, the flux for which is imported from Japan. A run of RA-12 integrated amplifier boards is in production when we stop by: 800 pieces will take around 5 days to complete. The ‘kiln’ is programmed with a unique temperature profile for each board so that its multiple chambers bring up the heat to the correct temperature at the right speed (lest components are fried). A grinder then removes part tails on the underside of the board before three staff workers manually clip away the tails missed by the grinder. The process can only be described as thorough. Thoroughness also runs right through Rotel’s quality control process. 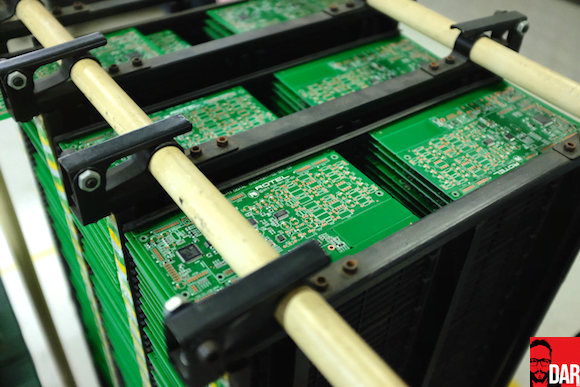 Each and every board is checked before being installed in its chassis and checked again. Problems are attended to at the repair station, located off to one side of the main testing area that sees a multi-step process applied to each unit: 1) the connectors are hooked up to a rig that records and stores test results alongside its serial number; 2) A two-finger drop test precedes listening – does the unit make music? ; 3) the burn-in rack runs each unit for anything between eight and twenty-four hours before being tested a third time. Orth explains how each Rotel model’s design starts with its power supply requirements. 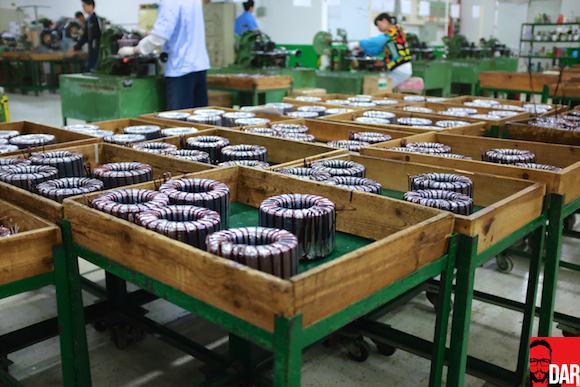 “It’s the heart of the machine”, he says before taking us around the transformer winding area of the factory. Rotel are apparently one of only a few hi-fi manufacturers that continue to wind their own transformers, something that it has done since swapping out power supplies in Sylvania TVs all those year ago. The steel used is still sourced from Japan. 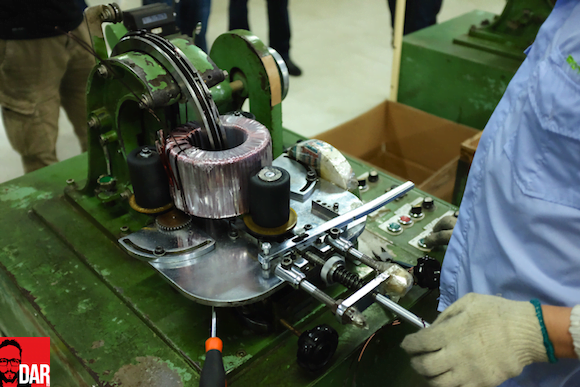 Transformer winding is a labour intensive process: each one is cut and wound back before being baked, wound and wrapped. 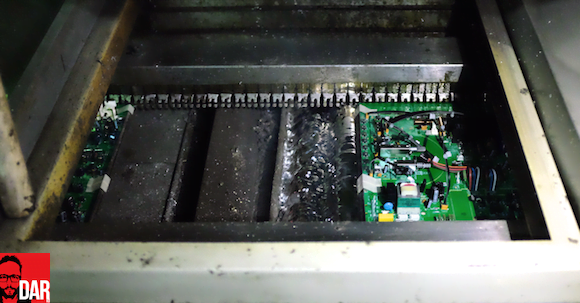 Like the board that it juices, each and every transformer is tested. Rotel don’t OEM for anyone else either. You’ll only see a large Rotel toroidal inside a Classe amp because it too is owned by the B&W Group. 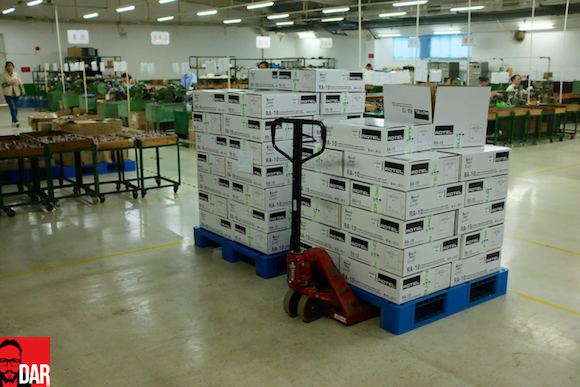 B&W loudspeakers aren’t made in the UK; they’re manufactured in the other half of the Zhuhai factory through which we are afforded a swift walk-through. The UK hosts Rotel’s sound and acoustic development team. Each Rotel model is voiced using B&W speakers for which team leader Robert Burn ensures consistency – he’s been there for twenty years. Rotel’s long-standing relationship with B&W doesn’t end there. B&W distribute their own products alongside Rotel in the UK as well as twenty other territories around the world. Our tour concludes with listening. By Orth’s own admission, the factory audition room needs room treatments. Nevertheless, Rotel D/A conversion and amplification pushing into B&W loudspeakers rendered ZZ Top’s “La Grange” with appropriate gusto. So are you going to review some Rotel gear? I think at CES 2015 they showed a new RC-1590 pre-amp that’s capable of decoding DSD. Would love to read a review of that and their other equipment. Nice article. I remember Rotel with fondness as they made the first entry level amp I purchased as a teenager. Big brushed Aluminium and grey box, minimal tone controls, a little blue LED with a large volume nob driving a set of Wharfdale Linton 3xp’s with an ADC direct drive turntable sporting an Ortofon cartridge front end if I remember correctly. The amplifier design still stands up today. It’s nice to see them back in the hifi world. John, thank you for this excellent article on Rotel! My first integrated amp was a Rotel RA930AX and it was and I assume still is an excellent amplifier. Really appreciate your work as I have learned a lot from your reviews!